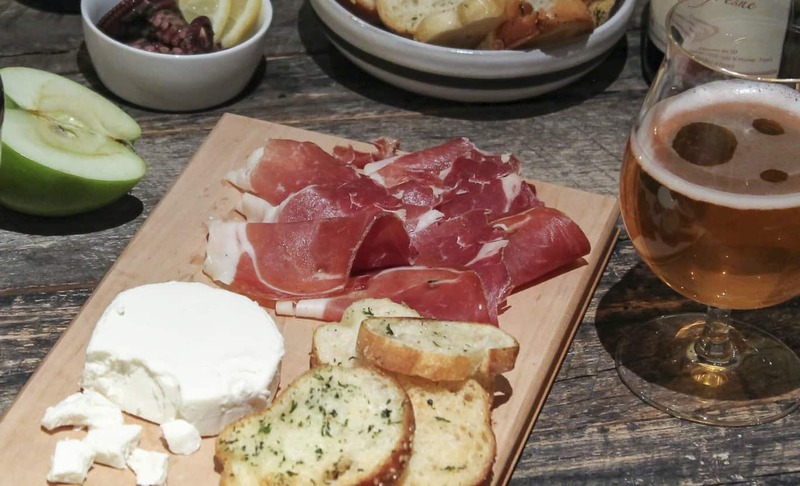 Cider lovers often wonder what the best food pairings are for their favorite drink, but figuring that out can be confusing, and the information is often not widely available. 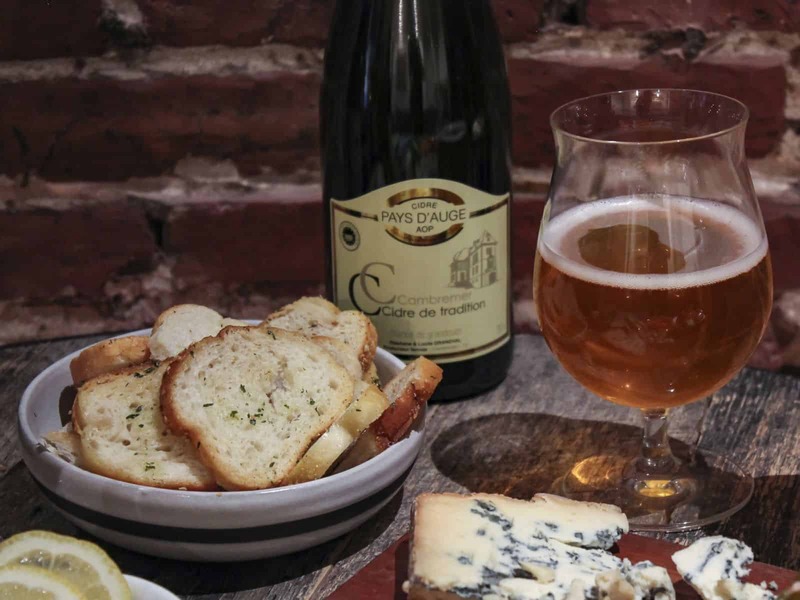 Not to worry—Cider Culture went to work and did a tasting, pairing foods with eight different French ciders, all from family-run farmhouse producers. France, although known for its Champagne and wine, has a rich history of making and drinking cider. Some apple farmers in Normandy even claim that they have the oldest of all cider-making traditions. The ciders we tasted came from Winesellers, one of only a few importers that have international ciders available in the United States. 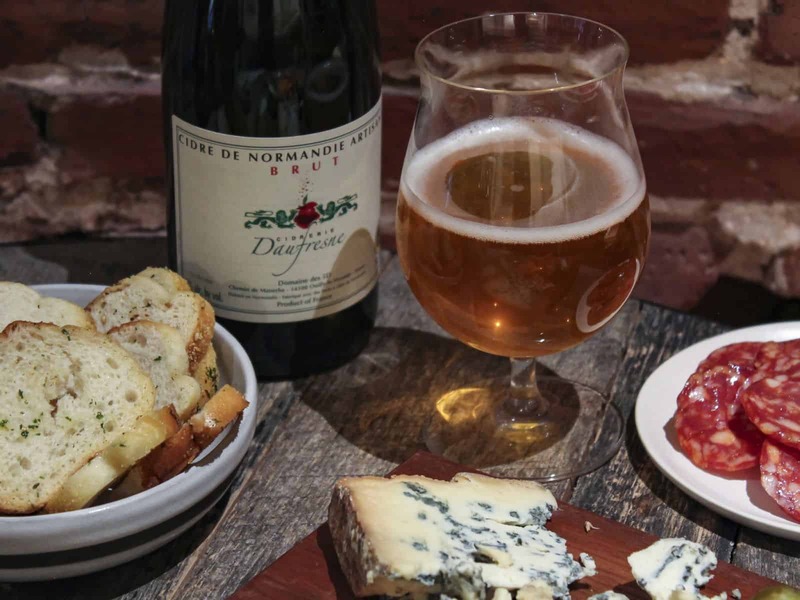 We sourced the food from Di Bruno Bros. Make your purchases online or in-store, where you can stop in to ask their knowledgeable team for help in pairing other ciders. This dry cider comes from Cidrerie Daufresne, a 40-year-old orchard in the lower part of Normandy. The cider is well-balanced with an apple aroma and hints of spice and sweetness. We paired it with pickled peppadews, goat cheese and some bites of fresh green apple. You could also pair it with your choice of tart fruits and roasted veggies. 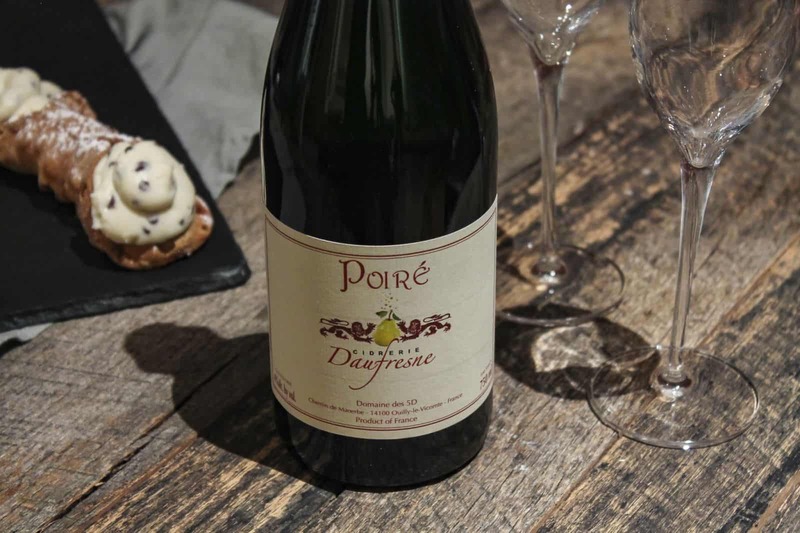 Also from Cidrerie Daufresne, this medium-dry perry goes well with seafood and cream-based desserts like panna cotta and creme brulee. The perry is more delicate and less tart than a traditional cider, and the pear flavors shine through. We paired it with a creamy cannoli, but found it also worked really well with all of the cheeses. This crisp, dry cider originates from Domaine de la Minotiere, a 37-acre orchard in Normandy, and was cultivated using 100% organic certified farming. We opted for generously stuffed pepper shooters filled with Cremosa Provolone and Prosciutto di Parma. The fiery cherry poppers were a nice, hot treat for a winter cider tasting. For those who did not want heat, they paired the cider with goat cheese and crostini. This cider from Domaine de la Minotiere leans on the sweeter side, with a subtle apple character and hints of citrus peel, musty floral notes and fruity aromas of apricot and citrus fruits. We paired it with goat cheese and prosciutto with crostini. For a complementary sweet touch, we recommend adding a cider reduction, apple butter or honey. It would also work well to make this cider part of a dessert pairing. These LeBrun ciders are both made from handpicked apples and fermented using natural methods. Although the organic cider has a bit more sweetness than the brut, we paired them with the same food quite successfully. We liked the cantaloupe-orange mimolette cheese, which is sweet and nutty like an aged parm. We also tried a strong blue cheese and found that a solid schmear on a crostini, along with a few bites of cured meats (like a mild pepperoni), was a crowd-pleasing bite to accompany either of these ciders. This medium-dry cider is produced by Manoir de Grandouet, a third-generation family farm with 30 acres of cider apple orchards located in the heart of the Pays d’Auge, Normandy. We started with marinated octopus with lots of olive oil and lemon zest. The subtle sweetness and fruity character of this cider makes it very versatile, so we also paired it with some cured meats and cheeses. We found that all of the cured meats and cheeses worked, but a soft blue cheese that was mild and meaty paired particularly well with this cider. 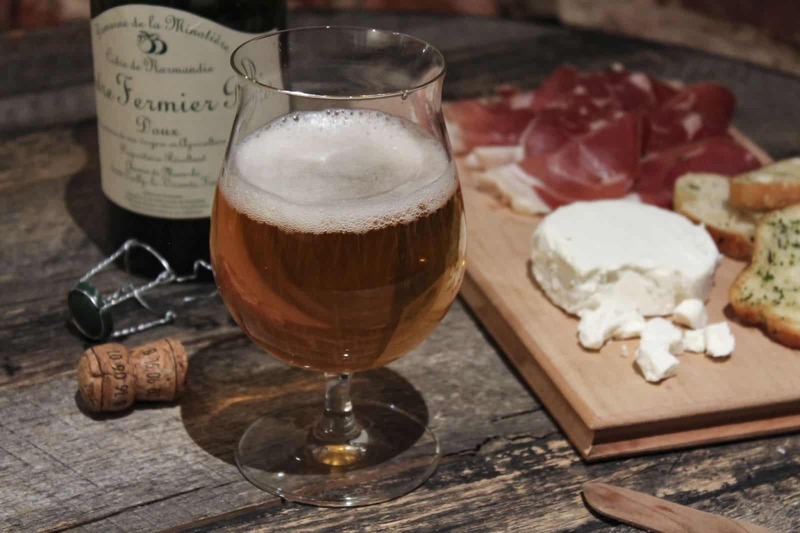 Any of the cured meats we tried complemented this dry cider from Manoir de Grandouet. With a smoky aroma and tastes of bruised apples and pears, we opted for a nice palate-cleansing finish of green apple with goat cheese. You could also try pairing it with seafood or poultry. There’s never been a better time than now to expand your French cider knowledge and eat well at the same time. Let us know what you try or if you have any go-to cider pairings. Santé! © 2018 Cider Culture. All Rights Reserved. A publication of Dish LLC.